Elgar’s brooding, anguished cello concerto is a beautifully bitter pill to swallow, taken by itself. So when the Allentown Symphony Orchestra, joined by renowned cellist Matt Haimovitz, tackled the monumental work Saturday night and Sunday afternoon at Miller Symphony Hall, it cleverly sweetened the bill. Sugar coating the Elgar on one side was the Pennsylvania premiere of Roberto Sierra’s bouncy “Montuno.” On the other side: Beethoven’s uplifting Symphony No. 5 on the other. It is difficult to hear Elgar’s E Minor Cello Concerto without some comparison, subliminal or otherwise, to the version performed by the English cellist Jacqueline du Pré. If Haimovitz lacked some of du Pré’s spontaneity, he more than made up for it with his passion and poise. His rich, buttery tone was a perfect match for the work’s weeping tearfulness. Indeed, in the first movement his cello sounded almost chant-like, channeling a sense of sadness akin to Max Bruch’s setting of the Hebrew prayer Kol Nidrei. The work was not without its flights of idyllic release, but these were brief and countered with stuttering cello pizzicatos and bowed sighs. Smooth glissandos rounded out the lyrical second movement, while in the third Haimovitz soared up into the instrument’s highest registers. 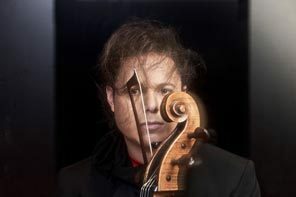 The orchestra, sounding string-rich, performed splendidly — an ideal soul-mate for the anguished voice of Haimovitz’s cello. “Montuno” was a slinky, seductive fusion of Spanish guitar and vocal music with the vibrant rhythms of Afro-Cuban percussion. Heavily based on the clave, a traditional Latin rhythmic pattern, the piece opened with the slow, rhythmical tapping of the claves — a pair of short wooden dowels found in African, Cuban and Brazilian music. From there it bloomed into a vibrant series of variations, each successively more energetic — à la Ravel’s “Bolero” — before coming to an exhilarating close. The work’s complex Latin rhythms were wonderfully orchestrated, and played by the orchestra with finesse at the Sunday afternoon concert I attended. Conductor Diane Wittry put new life into Beethoven’s fifth symphony by performing the old warhorse at the scalding tempo of nearly 108 beats per minute, which is where Beethoven originally wanted it. Not only that, she re-arranged the string section, placing the second violins on stage right — again, a common practice in Beethoven’s day. The outcome was a stunning gem of a performance, with clarity, crispness and panache. Most surprising in the performance was the second movement, which at its brisk andante con moto pace revealed more da-da-da-DUMs in its structure than usually heard. They were everywhere — in the main theme, the counter-themes, the cellos, the woodwinds. The entire orchestra was a pleasure to hear throughout the work — too bad the rapid pace brought it to a close so quickly.